As of 2014 all the club's pictures can be found on Facebook. You do not have to have a Facebook account to see the pictures. Click on the icon below for our albums. If you have any event pictures that you would like to share on our Facebook page please email them to our Dropbox account. Here are the instructions. 1. Write an email to webmaster@bcskiclub.org asking for the email address to the BCSC Dropbox. We can't put the email address for Dropbox here because of spam issues. 2. Write an email to the Dropbox email you've received from the webmaster. 3. Attach your pictures as attachments. This is usually accomplished by using a link that says "Attach a File" (GMail) or selecting a paperclip icon (Yahoo). Follow instructions to attach your photo files to your email. 4. Press send and you're done. Your email with the picture files attached will be sent to the folder in the BCSC dropbox account. 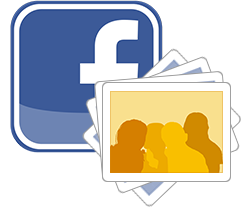 The webmaster will create a photo album on the club's Facebook page.